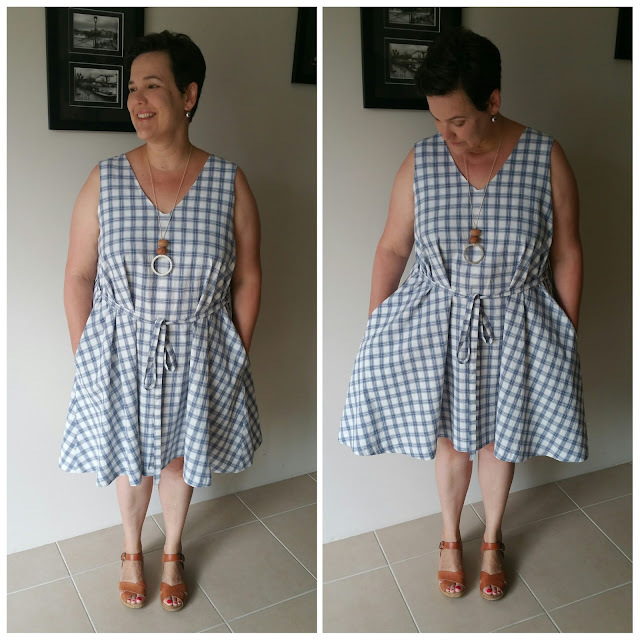 This make is a TOTAL departure from what I usual sew or wear...a dress in woven fabric! Who am I anymore? Anyway - I started thinking that I would like to make a non-knit dress. It would have to be sleeveless as I KNOW that I hate tight things on my arms. 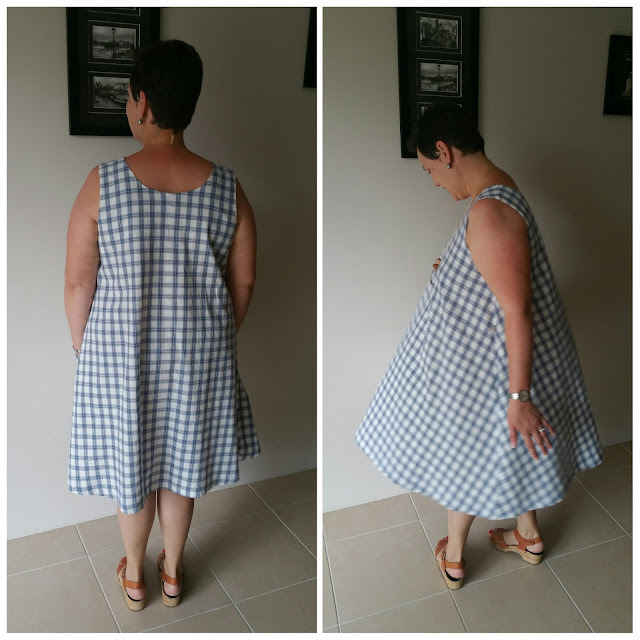 I didn't really mind too much if the dress didn't actually fit because I wanted to learn something new (not zipper or buttons new mind you). 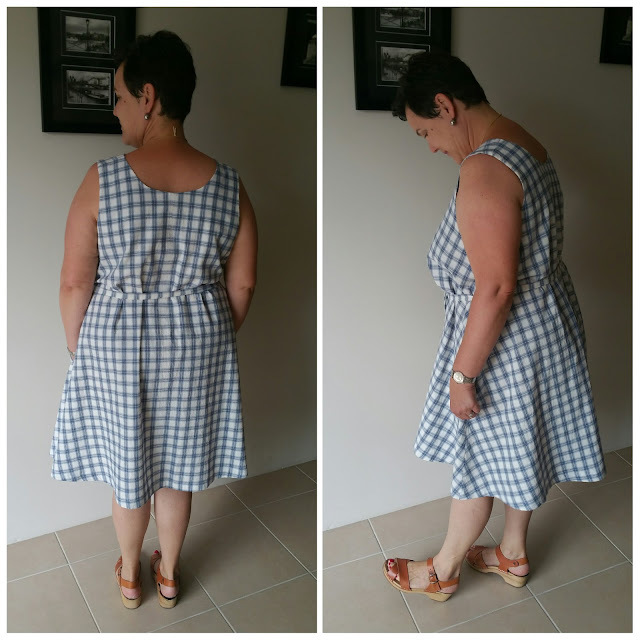 I settled on the Sway Dress by Papercut Patterns as there was a chance it could fit me (spoiler alert: it does) and it has a full-facing installed using the "burrito method" which has never crossed my sewing path before, along with a v-neck, belt loops and self-fabric belt. All in all this was a fairly simple sew though I did find getting a nice clean point around the v-neck tricky. 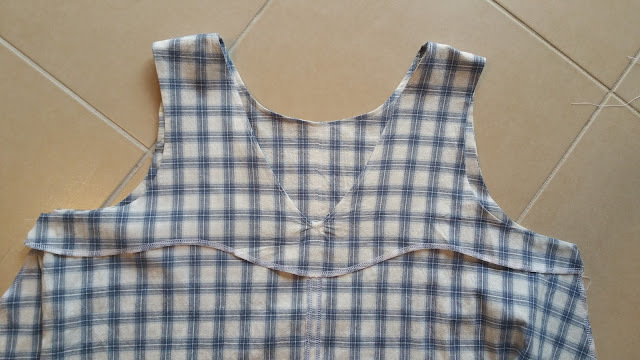 I also had a bit of trouble understitching the facing around the neckline so to make sure things don't flap around up there I also top-stitched the neckline down. I felt that when it came to making the burrito for my facing the instructions were quite....brief. I read that part of the notes about 20 times and just thought WTAF every time. I nearly gave up at that point, but I put out a cry for help on our Sydney Spoolettes facebook page and someone sent me a very useful YouTube link (thank you Evelyn). It was actually not very difficult but it really isn't until you pull the fabric through on itself you see that's worked (I have no idea how it worked, it just did)! I am also pretty chuffed with my belt loops. I was going to leave them off (lazy) but thought I should add them as a) it's a learning experience and b) they might actually be useful. 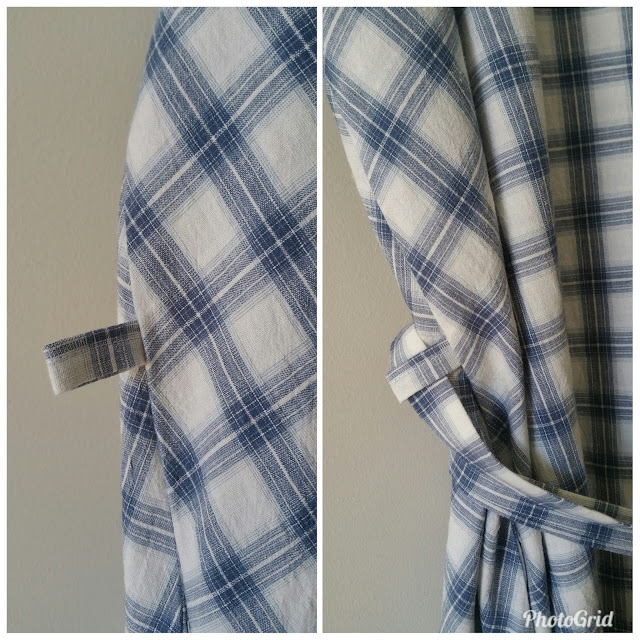 I found them quite fiddly to make so after a few attempts I made them longer than suggested, stitched them up and cut off the excess (they are still 1cm longer than drafted). The belt was quite easy although Dave turned it inside out for me as I was struggling. So, the fabric! 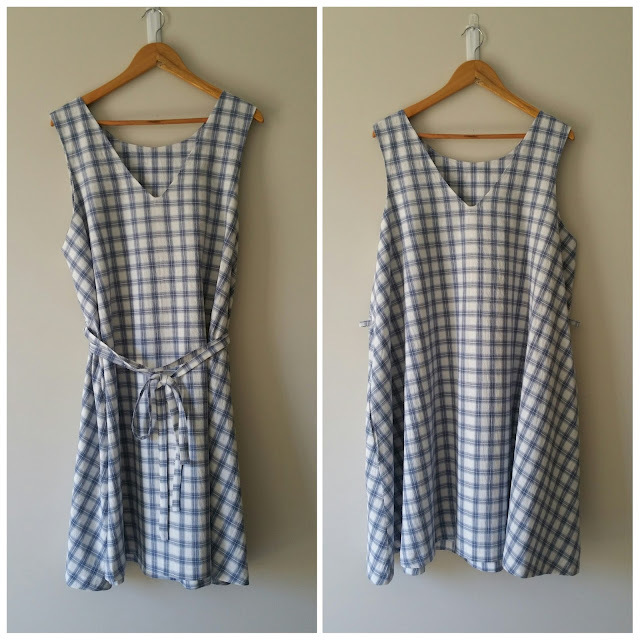 This is from Tessuti and they are selling it for $15/pm as part of their Skylines Sewing Competition. 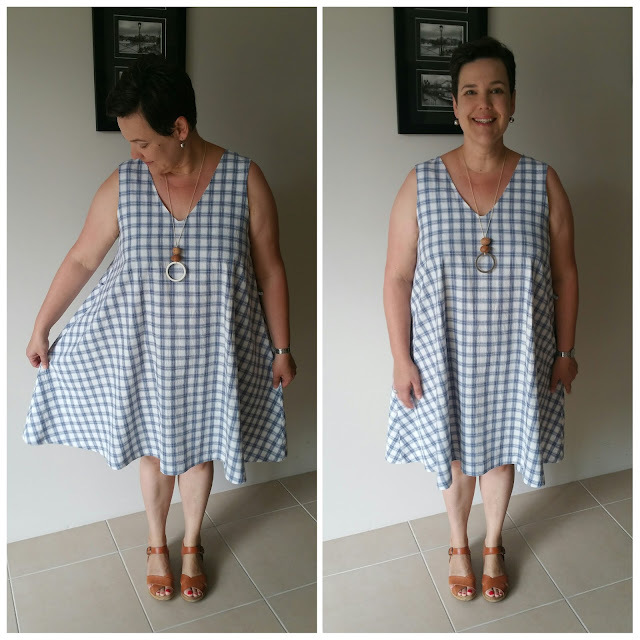 I was looking for a linen for my Sway dress and this came along at just the right time. 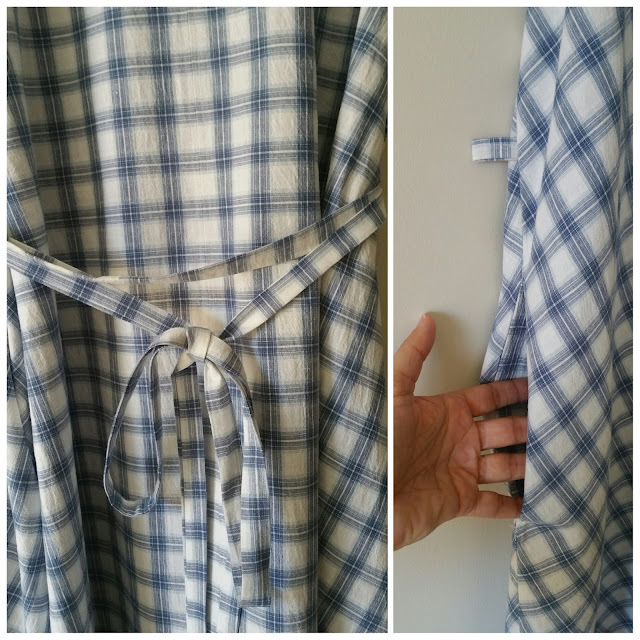 The fabric is 63% cotton, 16% linen, 20% viscose and 1% elastane - it was nice to sew with and held a press well. It was impossible for me to tell the right side from the wrong side so I didn't even bother with it. I wasn't going to submit my dress to the competition but in the end I'm pretty proud of this make - I think it's well made so why not? The big question now is, belted or unbelted I know which I prefer)? Fabric: Skylines - 63% cotton, 16% linen, 20% viscose and 1% elastane from Tessuti.